After a long winter the Trail Crew has been excited to get back down to business! Natural High received a new bridge and plenty of drainage/dirt work top to bottom. The trail will be running great for the season so go check it out. Ladies only received drainage and dirt work and the removal of blowdown that affected a few key sections. We will be continuing work on the trail which will include a bridge replacement. Lower Ladies had plenty of sections fixed up and is running the best it has in many years. Bobsled and Floppy Bunny received drainage work and you will notice new gold on a bunch of sections including berms! Both are running great and we will continue the work throughout the next few months to keep trails running great! The Crew has been out milling cedar for upcoming bridge projects, so keep an eye or nose out for new work. 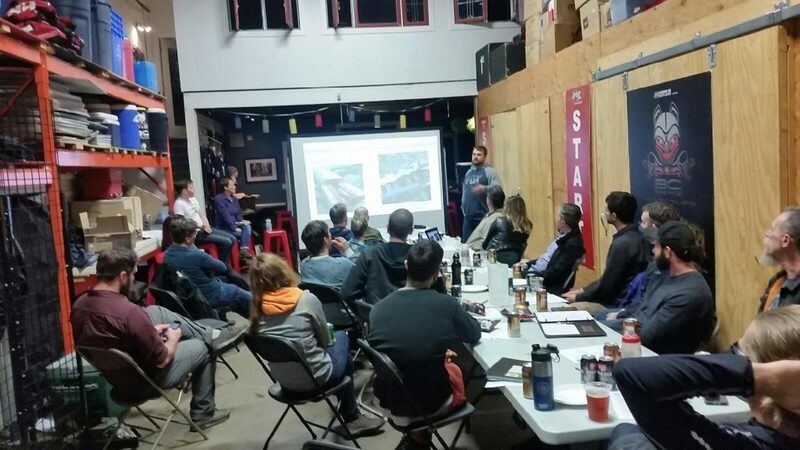 Last Thursday we hosted our Trail Adopter Plan (TAP) Builders at BC Bike Race HQ to talk about this year on the trails and roll out some cool projects for 2017. We are also excited to be looking for some support in Trail Building. We are hiring and you can checkout the positions available HERE NOW! Have fun out on the trails!